Brandon Tweet: Questionable republican and fickle Trump supporter @FrankLuntz joins the leftist peanut gallery and pushes the tired and debunked “#WalkAway is fake accounts narrative”. While 20% of his “followers” are fake accounts. Frank Luntz tweet: "Brandon Straka says he has received an uptick in the number of people who say they’re “walking away” from the Democratic Party to vote ... See More for Republicans on November 6.” Then what happened on November 6th, Brandon? TT People are not being told that the Republican Party is on track to pick up two seats in the U.S. Senate, and epic victory: 53 to 47. 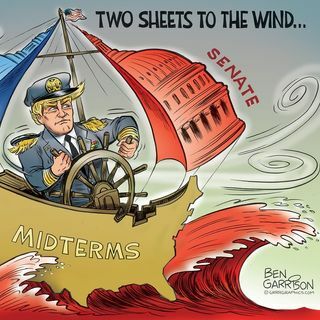 The Fake News Media only wants to speak of the House, where the Midterm results were better than other sitting Presidents. FL #Demonrat ADMITS Party Leader Directed Staffers & Volunteers To Use ALTERED FORMS AFTER Nov 5 Deadline To AFFECT OUTCOME Of Elections. They lie & cheat to win b/c too many #WalkAway from their years of broken promises. Laura Loomer BREAKING: Official ballot ties used to secure boxes of provisional ballots have been found cut off outside of the #BrowardCounty Supervisor of Elections office. Ben Bennett who worked inside the elections office under Brenda Snipes told me this is evidence of ballot tampering. Tweet by Ruby : Can someone explain to me how s h a r i a babe @IlhanMN is going to take an oath to protect and defend the Constitution of United States? And this is not the last ban I’m going to work to lift.